Quoting a HAAD projection report, he said that Abu Dhabi will need 4,800 new doctors and 13,000 new nurses by 2022, while the Director General of the DHA estimated that Dubai will need 7,323 more doctors and 8,510 nurses over the next decade. Shaikh added that the high cost of medical treatment and limited superspecialised care in areas such as oncology and cardiology are driving outbound medical tourism. “We have a clear vision — to reinvent cost effective disease management through early detection and intervention. 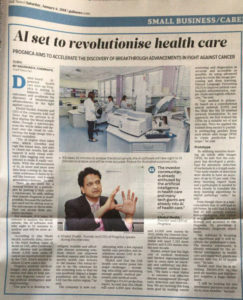 We are tackling this long term goal by making cancer screening and diagnostics as accurate and accessible as possible, by using advanced analytics tools like image processing and deep learning, Natural Language Processing (NLP) to improve patient care, hospital administration, supply chain and logistic efficiencies.” he said. Shaikh said that he is investing Dh500,000 in the next six months and this project requires a huge investment. “I will be looking for two investment partners only after six to nine months,” he said.